Hello. My name is Christa and this is my blog. I’m a native New Yorker now living in Louisville, Kentucky. 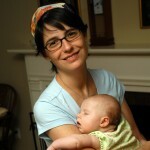 I am a litigator-turned-SAHM (stay at home mom). I live with my wonderfully supportive husband, Elliott, my cheerful one-year old daughter, Lillian, our often mischievous beagle, Hazel (aka the Nut) and our schizophrenic cat, Mowgli (aka the Jerk). Clearly, I like adjectives. So, why MushBrain? Scientists have found that mothers of newborns temporarily lose IQ points – along with memory and other cognitive skills – in the 24 hours following the birth of their child, i.e. the mushbrain effect. Personally, I noticed the points dropping off shortly after getting pregnant and still wonder if I’ll ever get them back now that I’ve spent over a year at home with my little munchkin. Truth be told, I would rather do nothing else than stay at home with my daughter, but there was a time when I spent the majority of my day analyzing the fine details of American law. And now I spend much of my day fighting off the urge to sing the painfully catchy theme song to “Elmo’s World” — most noticeably, when I’m standing in the middle of a room, baby in tow, wondering what I was planning to do there. This blog is my attempt to fend off the all too frequent bouts of mushbrain that strike when I spend too much time thinking about mommy stuff and not enough time interacting with the outside world and adult human beings. I’ll post about a variety of topics, many of which will no doubt indulge my mushbrain’s propensity for focusing on all things baby. But I also hope it will be a springboard for thinking about other topics for moms like me — and other mushbrained beings — who are looking for a bit of brain stimulation. Funny how facebook can reunite people after so many years. I really like your blog. My wife is pregnant and she is convinced that she is already losing IQ points. So, I guess we’re in for a real treat once the baby comes. I thought that you’d find another factoid interesting. A friend of mine studies testosterone in men and he found that when a man has a child, his testosterone drops. So, moms get less smart and dads get less manly right around birth. Hilarious. Thank you. Great to hear from you and congratulations on the baby on the way! Parenthood is an exciting ride. You and your wife will love it – even if you’re a little less manly and she’s a little dimmer. What a hilarious fact! Thanks for sharing. And glad you are doing well.